Back in the 1980s, when my RS obsession was last in full force, I listened to these records countless times – along with “Beginnings,” “Wait for Night, “Beautiful Feelings” and “Hard to Hold” – but sadly sometime in college during a move, my entire record collection disappeared. Years later I picked up a “Success Hasn’t Spoiled Me Yet” record for RS to sign, but I didn’t even have a stereo by then. Anyway, I’ve listened to the songs here and there via YouTube videos – and a few live, which was amazing of course – but there’s something unexpectedly thrilling about seeing mini-little versions of the albums I once held so dear (and probably spent hours staring at when I was 13, especially the back cover of “Working Class Dog”). And there’s also something special about hearing the songs in the same order (without advertisements) as I did so long ago. 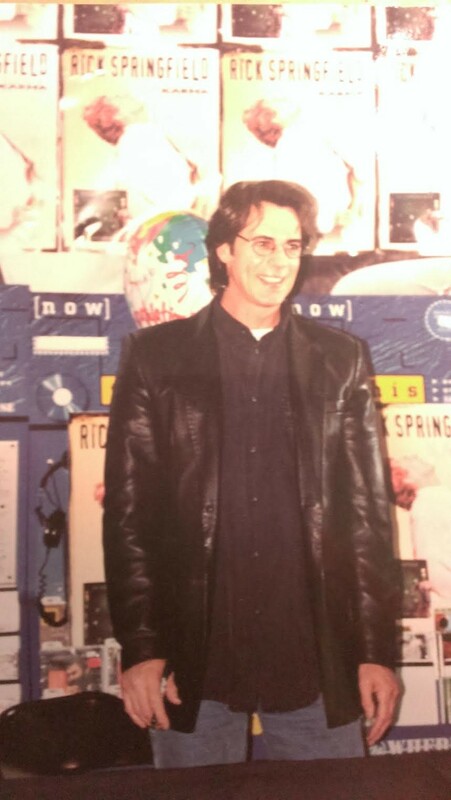 One month from today I’ll be at a Rick Springfield concert! 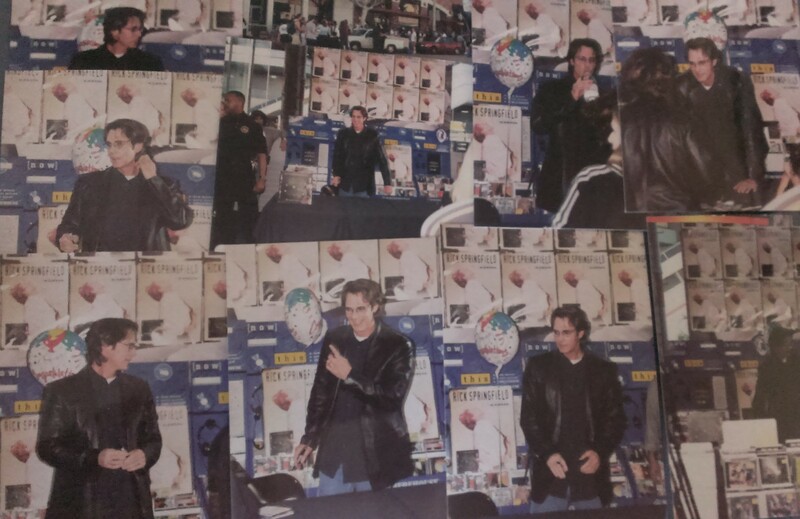 Although I’m in no position to pay for a meet and greet, I thought I’d reminisce about the one time I did meet him. 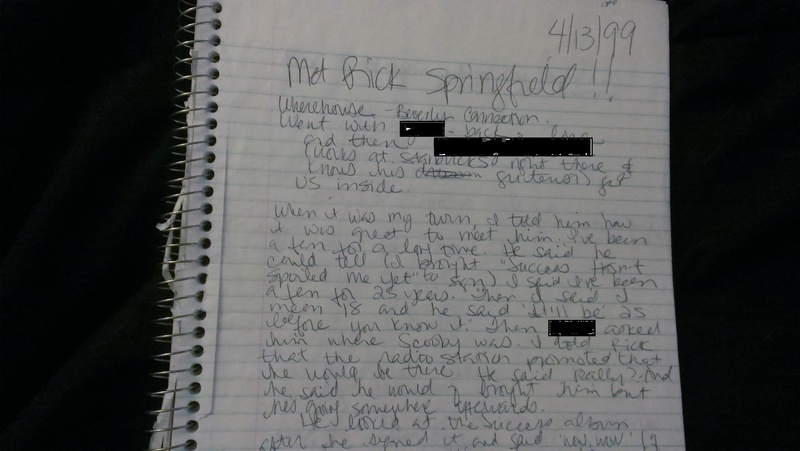 I recently found my journal from that year – 1999 – so I now have a better idea of what happened. (Before that, it was all a blur, although I remember he looked very cute and was very nice). Then the person I was with asked him where Scooby was. I told Rick that the radio station promoted that he would be there. He said, ‘Really?’ And he said he would have brought him but he was going somewhere afterward. And that was that. 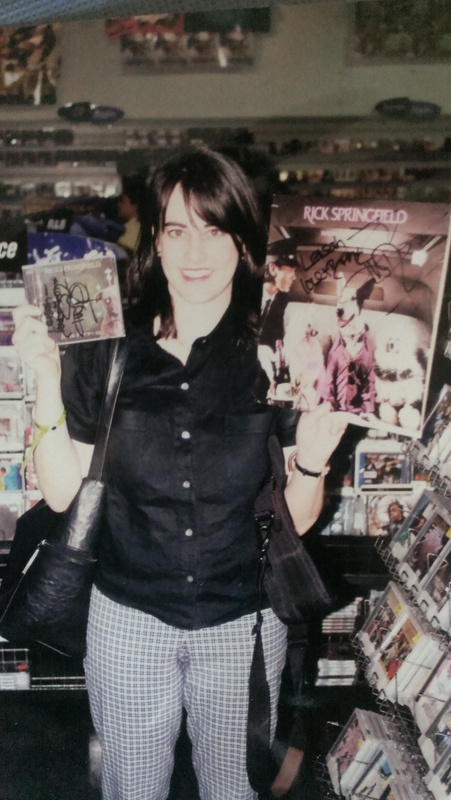 I had hoped that I’d also find a photo of me posed with him but this was long before selfies and there were just several shots of him and then one of me afterward with the signed CD and album. And then also in the photo envelope (long before digital cameras), were three photos of a white cat sleeping on top of a black car. Really? I couldn’t think of a better way to use up my film while in the same room with RS? Photos taken while I was waiting in line to meet RS.